Bordering Umbria, Lazio and Abruzzo makes it a great location for those who want to see another part of Italy without being totally isolated. 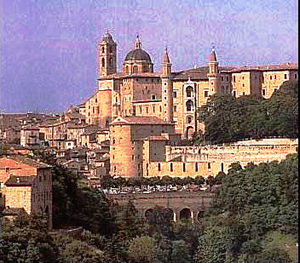 Well preserved in its Renaissance splendor, the fairy tale town of Urbino is fascinating to explore. One of Italy's best kept secrets, the magnificent Palazzo Ducale, houses Raphael's "La Muta" and works by Piero della Francesca. Ascol Piceno and Europe's oldest republic, San Marino, are must sees of this region. Like Vatican City, San Marino has its own mint and stamps but also boasts its own soccer team. For a less crowded atmosphere, nearby San Leo is just as dramatic, sitting on the slopes of Monte Titano where Dante once looked out upon and described its landscape in Purgatorio.